Imagine what your coffee carafe would look like if you never washed it. Not a pretty picture, is it? That oily residue that clings to your carafe is accumulating inside your coffee maker with every brew cycle, and over time, it can ruin the taste of your coffee and shorten the life of your machine. 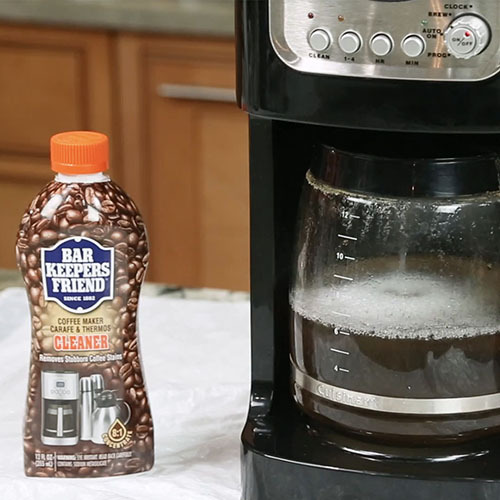 The best way to clean a coffee maker and remove grimy residue is to use Bar Keepers Friend’s Coffee Maker Cleaner. Hint: You can also use our Coffee Maker Cleaner to clean soiled coffee mugs, carafes, and thermoses. Bar Keepers Friend Coffee Maker Cleaner works best when your coffee maker is free of mineral deposits, so use Bar Keepers Friend Coffee Maker Descaler before using the cleaner. Both products are safe for most surfaces, but if your countertops are marble, granite, or natural stone, cover them before descaling or cleaning (splashes and spills could potentially cause damage). Remove any disposable filter from your coffee maker, and empty the reservoir and carafe. Fill your carafe with cold water, and put on protective gloves. Fill the carafe, using one ounce of Bar Keepers Friend Coffee Maker Cleaner for every eight ounces of cold water. Carefully pour the contents of the carafe into the coffee maker reservoir and start the brew cycle. Once the brew cycle is complete, leave the cleaning solution in the carafe for three to five minutes (up to 30 minutes, if the carafe is badly stained), then empty and rinse the carafe. Fill the carafe with cold water only, pour the water into the reservoir, and restart the brew cycle to rinse away any remaining cleaning solution. When the brew cycle is complete, dump the contents of the carafe. Your clean coffee maker is now ready to use! To keep your machine running smoothly, use Bar Keepers Friend Coffee Maker Descaler and Bar Keepers Friend Coffee Maker Cleaner every three months (or more often, if you have hard water). Download our easy-to-follow guide on how to clean oils and grime from your coffee maker.